Hang on. What just happened? 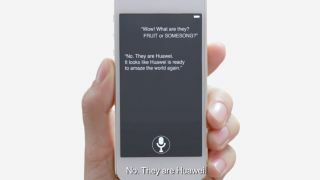 Huawei has launched a MWC 2014 teaser video starring - wait for it - an iPhone. Well it's not technically an iPhone (for legal reasons we're sure) - there's no home button for a start - but the Siri-esque interface and robotic voice tells you all you need to know. The video promises "a new tablet with a beautiful slim design" and a battery which provides "days of use" - and Huawei can't help but throw in a smart remark about the iPhone's small screen. Huawei also reveals it'll have "a new multimedia tablet" for the "ultimate entertainment experience" at the show - and from the brief glimpses we get of the slate it looks to have some HTC One style speaker grilles. Huawei will also have some new smartphones at MWC, and one is claimed to have "an amazing front camera" - perfect for those all important selfies. Finally, there will be another handset with support for the next-gen LTE advanced networks which are currently rolling out in parts of Asia. As a final dig Siri is asked if the devices are by "Fruit" or "Some song" (the answer is obviously Huawei) - but we want to know what happed to "Sore Knee" and "Elle Gee".